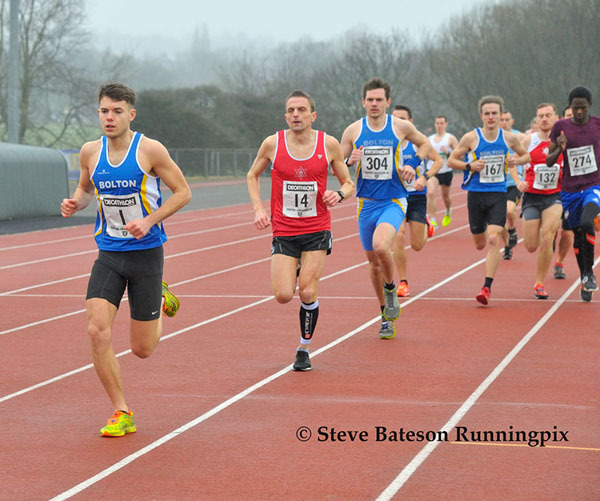 The seventh CL5K, now the traditional CLGP season curtain-raiser, saw the Blue Vests’ 32-strong squad put in a collective performance that demonstrates suitable intent on unifying the four team titles. Jonathan Kay set the tone, storming to victory in the men’s race and matching the 15:52 mark set by Horwich’s Chris Farrell – last year’s winner. 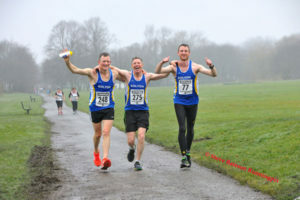 Tommy Harrison’s bronze, behind Warrington’s Nick Jones, and John Knowles’ fifth (and first vet position – M45) saw BUH&AC collect the race first team prize. Equally impressive, the women’s race saw Bolton’s Laura Lombard lead from start to finish, though clubmate Catherine O’Dwyer, returning to the CLGP after 20 months, exerted pressure with a barnstorming final 600m, narrowing the gap to just 2 seconds by the finish line. Junior Katie Oakley was the third team counter and allowed the women to make it a double team victory. With last year’s silver medallist Nicky Cartridge volunteering for marshalling duties, following yesterday’s 26:53 (fourth overall) at the Astley Park edition of the South East Lancs XC series, allied to the number of juniors coming through in the endurance discipline, it is certainly exciting times at Leverhulme Park. With 20 points, hopes of winning the elusive CLGP female team title come October are credible, though Leigh (25) and Burnden will undoubtedly have a say. Bolton’s A Team (first 10 counters) featured first junior Declan Toomey, the improving Rhys Francis outsprinting Paul Wolstencroft, and Craig Kenny bookending to take an early season lead of 111 points to Leigh’s 227. The B Team, comprising the next six counters for 2017 (i.e. positions 11 – 16), included exciting prospect Lewis Aldred, and Paul Mills holding off Stephen Bonney as the last sub-20-minutes crew. The eventual standings saw the friendly rivalry with Burnden Roadrunners reignited (298 to BRR’s 619), which was replicated in the Veterans’ series (40 to BRR’s 92) courtesy of Chris Pickford’s final counter. There was an assured debut from Molly Philbin, who stepped up from the junior ranks with aplomb, whilst significant age category positions were collected by Chris Povey (M40), Paul Wolstencroft (M50), Ken Fowler (M60) and Stephen Zlotty (M70). Photos (RunningPix) – Many thanks to Steve Bateson of RunningPix for the images here. 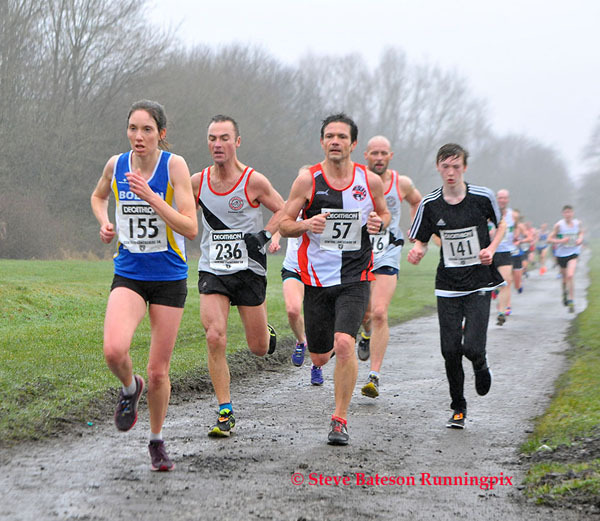 Elsewhere, Gary Jones clocked 1:12:25 in the Rugeley 10M for 33rd overall (M55 silver).